Engagement and Exploration possibility – what’s the scope of the activity? The Eureka moment can strike anytime! We accept ideas for the Preliminary Stage all year round. Just proceed to submit your innovation after registering yourself. You can have multiple ideas and we would be happy to review them, a maximum of two entries per phase. The deadline for submission is 6 January 2019. We will be accepting entries from 1st November 2018. Preliminary submission will be online. The teacher can choose any science topic that appears in the school curriculum of any board and is allowed to submit upto three entries for evaluation in each evaluation cycle. Description of Science and most importantly photos, illustration and / or video of the activity. Review a sample submission in the Resources section of the website and download it in the Download page. 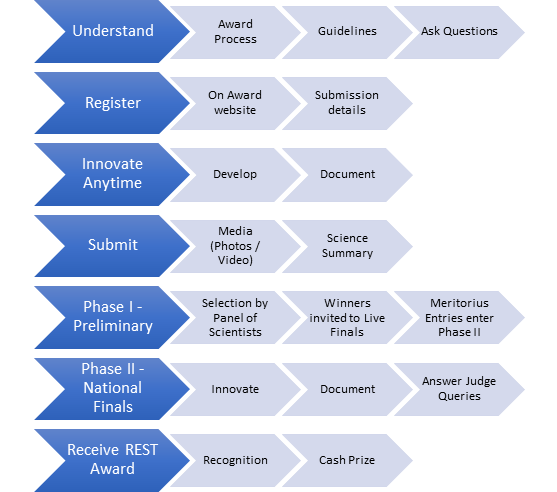 For the Finals, 60 selected finalists, will be invited to participate in an Online National Finals in three categories – Physics, Chemistry and Biology. The National Award Winners will receive the award at Panchavati, the former Home of Sir C.V.Raman on 24th February 2019.